CONSTANTA, Romania (AP) - Bird flu was detected on a small farm in Romania's eastern Danube Delta, leading authorities to slaughter 90 hens and ducks to prevent the disease from spreading, officials said Wednesday. Preliminary tests on 15 birds that died at the farm showed they were infected with the H5 subtype of bird flu, Tulcea county official Lefter Chirica said. Further tests were being conducted in Bucharest to determine if it was the deadly H5N1 strain, which has killed dozens of people around the world, Chirica said. No quarantine has been imposed around the farm, located in Murighiol, a delta village some 250 kilometers (155 miles) northeast of the capital, Bucharest. But authorities were disinfecting vehicles in the area, as well as the shoes of those traveling through on foot. Since 2003, it has killed at least 206 people worldwide, and it has ravaged poultry stocks in Asia, where it was first detected. Scientists believe it spread to Europe and to Africa with migratory wild birds. In Europe in recent years, H5N1 has been found in France, Switzerland, Germany and elsewhere. In Romania, hundreds of birds died of bird flu 2005 and 2006, many in the Danube Delta, but there have been no cases of human infection in Romania. Human cases have been recorded in Turkey and Azerbaijan, though bird flu is difficult for humans to catch. Experts fear, however, that it could mutate into a form that spreads easily among people, potentially sparking a pandemic. Experts believe most victims were probably infected through direct contact with sick birds. BRUSSELS (Thomson Financial) - The European Commission said it has sent Romania a "reasoned opinion", the final warning before taking the country to the European Court of Justice, asking it to change its legislation on car taxation. The commission sent Romania its first warning in the spring, pointing out that its national rules on car registration tax were incompatible with EU rules. The EU executive said Romania did not provide satisfactory answers to its concerns and has not modified its legislation. Under Romanian law, car tax is not in line with the actual depreciation of similar cars registered on the domestic market. In fact, the tax is increased on the basis of the car''s age alone. The commission is concerned that, as Romanian car registration tax is levied only once, imported used cars fall within the most heavily-taxed category. Stockholm, Sweden (LifeNews.com) -- While the movie Bella captures the hearts of millions of American moviegoers with its respect for life, a movie which offers a look at illegal abortions took home another prize from an international film festival. The Romanian film "4 Months, 3 Weeks and 2 Days," won top prize at the 18th Stockholm International Film Festival. The movie examines the illegal abortions that were done in communist-era Romania when abortions were prohibited -- a topic frequently used as propaganda by abortion advocates to argue for legal abortions. Featuring Anamaria Marinca, it focuses on the "horrors" a student endures to help her friend have an abortion. It's named after the age of the baby killed in the illegal abortion. The movie took home the top prize at the Cannes Film Festival in May when pro-abortion activist Jane Fonda handed director Cristian Mungiu the award. According to an AFP report, the Stockholm officials selecting the best movie said the film "expresses the impact of societal repression on its characters with honesty and devastating humanity." Marinca, who plays a character who helps her friend obtain an illegal abortion, won the festival's Best Actress award. "We forget we are watching a 'performance' and instead experience, moment by devastating moment, the brutal events of this day in the life of Otilia," the Stockholm officials said about the events in the film. After the Cannes win, Mungiu said getting the top prize, the Palme d'Or, is "like a fairy tale." "It looks a little bit to me like (a) fairytale," Mungui said, adding that the win showed "you don't necessarily need big budgets and big stars to make stories." The director spent very little on the low-budget film and almost didn't have enough money to make it. In an apparent attempt to make the movie less polemic Mungiu does include a shocking image of the aborted baby and a graphic description from the abortion practitioner of the abortion procedure involved. One review of the movie said it also focused on the abortion practitioner's "chilling exploitation of the women's dilemma." "Because of the pressure of the regime, women and families were so much concerned about not being caught for making an illegal abortion that they didn't give one minute of thought about the moral issue," Mungiu told reporters about his film. "It was either you or them getting you for what you did." He said he put the image of the dead baby after the abortion on the screen to making a point -- "people should be aware of the consequences of their decisions." The award comes two years after pro-abortion film "Vera Drake" failed to win any awards at the film festival. It later took home awards from the Los Angeles Film Critics Association and the European Film Awards and was a contender for a Golden Globe. Bella won awards as well, including the top honor at the Toronto Film Festival and the directors and producers hope it will win further awards after its run in theaters is complete. BUCHAREST (AFP) - Romania's first election to the European Parliament this weekend dealt a severe blow to Prime Minister Calin Tariceanu and his party, with the opposition winning by a substantial margin, preliminary results showed on Monday. According to a partial vote count on Monday afternoon, the opposition Democratic Party (PD) won 28.78 percent of votes on Sunday, followed by the fellow opposition Social Democratic PSD with 23.14 percent. Tariceanu's National Liberal Party (PNL) came only third with a 13.45-percent share of the vote. The final official results were scheduled to be released before Wednesday, with the allocation of seats in the EU parliament expected a few days later. Turnout was low at 28.4 percent, but that was around the average for EU elections in other post-communist countries. In May, 28.6 percent of Bulgarians had turned out for their first EU election. "The PD has achieved its goal of winning the European elections," boasted party chief Emil Boc. Nevertheless, the PD's showing was actually disappointing: pre-election polls had forecast the party winning 35-40 percent of the vote, fuelling hopes of victory in next year's municipal and parliamentary elections. "It's a victory without glory," diagnosed the daily Cotidianul. That view was shared by political analyst Alexandru Lazescu, who said the PD "must understand that its position is still fragile and future election battles will be more difficult than expected." Tariceanu's liberal party tried to put on a brave face, with the premier himself claiming that "Romanians have given us their vote of confidence." Party deputy Ioan Ghise nevertheless described the PNL's showing as "modest", arguing that the battle the liberals had been waging for more than a year with President Traian Basescu had tarnished their image in voters' eyes. Sociologist Mircea Kivu suggested the PNL "is paying the price for the corruption scandals" surrounding a number of ministers such as Decebal Remes, who quit as agricultural minister in the wake of a bribery scandal last month. Even pension increases and promises of higher wages have been unable to boost the government's showing. By contrast, the tiny Liberal Democratic Party or PLD, formed from a breakaway from the PNL just a year ago, surprised in the polls, coming fourth with an 7.78-percent share of the vote. Strengthened by such a showing, the PLD vowed to collect enough signatures to file a vote of no confidence in the government. "We can't allow Romania to lose even more time as a result of a government that does not enjoy voters' support and only takes care of its own interests," PLD chief and former prime minister Theodor Stolojan told AFP. For their part, the Social Democrats have been able to make good some of the ground lost over the failure of their leader Mircea Geona to force a vote of no confidence in the government and depose prime minister Tariceanu. The Hungarian minority in Romania will be represented in the EU parliament by the Hungarian Democratic Union of Romania or UDMR, which won 5.8 percent of the vote and the only independent candidate, Reformed Bishop Laszlo Tokes, who secured 3.8 percent. In all, Romania will send 35 deputies to the European Parliament which is based in Brussels and Strasbourg. They will replace the existing 35 observers sent by Bucharest to Brussels in September 2005, who have had full voting rights since Romania formally joined the EU on January 1, 2007. The new members of the European Parliament will only have an 18-month mandate before facing re-election, since there are EU parliamentary elections scheduled across the bloc for June 2009. Bucharest - A judgement by Romania's constitutional court Tuesday should make it easier to prosecute politicians. From now on Romania's president alone will decide whether to lift the immunity of a minister after it is requested by the public prosecutor. Up till now the head of state was required to get the legal opinion of a commission of judicial experts. The court has now declared this process to be unconstitutional. Tuesday's judgement is considered sensitive because Romania's Justice Minister Tudor Chiuariu recently dissolved the expert commission shortly after learning that the public prosecutor was investigating him and Labour Minister Paul Pacuraru on corruption allegations. Chiuariu was accused of trying to prevent his own prosecution by dissolving the commission. Gabriel Resources Ltd, owner of the Rosia Montana gold project in Romania, said a court annulled a permit related to the operation. The shares plunged. The decision can be appealed to the nation`s Supreme Court, Toronto-based Gabriel Resources said on November 27 in a statement. Kathy Sipos, a Gabriel spokeswoman, didn`t immediately return a voicemail message seeking comment. Romania`s government suspended an environmental review of the project in September after non-governmental organizations challenged the company`s plans. The review must be completed before Gabriel will be permitted to tap the 10 Moz deposit that would be Romania`s largest mining operation. "We are very disappointed in the decision based on the merits of this case," Gabriel`s chief executive officer Alan Hill said in the statement. "We must wait to receive the rationale behind this decision before we determine our next steps." Gabriel dropped 15 cents, or 9.3% to C$1.46 at 10:53 am in Toronto Stock Exchange trading, paring its market value to C$372.2 million (US$373.7 million). A close at that price would be the biggest decline since November 15. Romania: Who Cares About Politics? Voters’ disappointment and ignorance marred Romania’s first European elections, while a referendum on changing the electoral system failed due to low turnout. It's a cold Sunday evening outside a pub on Lipscani Street, in central Bucharest. Inside, more than two dozens youngsters are glued to a huge television screen showing an eagerly awaited football match between two local teams. “Elections? What elections? You are crazy, man, this is the real life”, says Marcel, 18, while sipping from a glass of vodka. He soon turns back to the screen and starts shouting advice to his favourite football players. Like Marcel, most of the 18-year-old first-time voters, born after the end of communist rule in 1989, did not bother to vote on November 25. These were the first elections for the European Parliament, EP, held in the Balkan country since it joined the EU on January 1. Only about 28 per cent of registered voters cast their ballots in the elections, much less than the average voting in local or parliamentary polls in previous years. “The Romanian electorate wasn’t interested at all in these elections. Despite their strong support for the EU, Romanians are not yet concerned about real European issues”, political analyst Stelian Tanase told Balkan Insight. “That's why politicians focused in their campaign more on living standards and on the fact that people are now free to move around the EU”, Tanase said. Journalist Mircea Marian, from the leading daily, Evenimentul Zilei, says there is another reason for people’s lack of interest, the fact that many of them doubted the candidates’ qualifications to stand. “Every party put at the top of its list a ‘star’ candidate, followed by a ‘rabble’, lacking in both experience and character”, Marian said. Thirteen parties were fielding candidates. The vote for the 35 members of the European Parliament is seen mainly as a test of the popularity of leading political parties ahead of the parliamentary election due next year. The centrist opposition Democratic Party – which is close to President Traian Basescu - won the elections with 28.8 per cent of the vote, while the Social Democratic Party, PSD, seen by many as the successor to the one-time communists, came second with 23.1 per cent. Prime Minister Calin Popescu Tariceanu’s government suffered a setback in the elections, with his National Liberal Party, PNL, receiving only 13.4 per cent of the vote, although that was a few percentage points more than expected. The Liberals tried to put a brave face on their performance, with Tariceanu himself claiming that "Romanians have given us their vote of confidence." But voices from inside the party described the PNL’s results as “modest”. Political analysts say that infightings between the Liberals and President Traian Basescu, going back over some two years, had tarnished the PNL’s image in voters' eyes. “Furthermore, the PNL paid the price for the government's record on reform since EU accession and for the fact that some of its ministers were involved in bribery scandals”, sociologist Dumitru Sandu told Balkan Insight. In October, the Agriculture Minister Decebal Traian Remes stepped down following the launch of a criminal investigation against him for alleged corruption. The Liberal Democratic Party, PLD, won about 7.7 per cent, followed by the Hungarian Democratic Union of Romania, UDMR, with 5.5 per cent. One surprise of the elections was the success of an independent candidate, Bishop Laszlo Tokes of the Reformed Church, who broke with the UDMR because he considered it was not doing enough to represent Romania’s ethnic Hungarians. Tokes, a fearless preacher whose arrest sparked the 1989 revolution that overthrew the dictatorship of Nicolae Ceausescu, is now a strong supporter of more autonomy for Romania's 1.5 million-strong Hungarian community. Romania’s nationalists fared poorly in the elections, with the Greater Romania Party of Corneliu Vadim Tudor and the New Generation Party of football club owner Gigi Becali failing to secure seats in the European Parliament. Tudor, who was once a leading candidate for the presidency, announced on Sunday that he would resign from Romania's parliament, while staying on as party leader. Several low-ranking officials of his party said a day later they would be stepping down from their posts. But on Tuesday, Tudor announced that he had changed his mind about the resignation. Meanwhile, Becali denied there was a crisis inside his party, and said he had no intention of stepping down. “The results of the EP election do not represent a surprise at all. They are more an indication of the electoral prospects of the parties, ahead of local and parliamentary election next year”, sociologist Mircea Kivu says. Along with the elections to the European Parliament, Romanians were voting in a referendum, pushed by Basescu, on proposed changes to the electoral system to move away from the existing one based on party lists to one in which they vote for individual candidates. But low voter turnout marred the referendum, rendering it invalid because the required turnout of 50 per cent was not reached. Nearly 90 per cent of those who actually voted supported the plan, based on the French electoral system, where votes are cast for individual candidates, a system designed to make politicians more accountable and curb top-level graft. Basescu will now have to sign into law a rival plan, backed by the government, to introduce a different electoral mechanism. It is based on German-style voting where each citizen has two votes, one for an individual candidate and another for a party. The president had earlier refused to sign the draft, pending the referendum. “Business as usual in Romanian politics. There was a general ignorance about the proposed voting system. It's clear that Romanians have no faith in their own vote. They don't believe they have the power to change things”, says Elena Popescu, who is studying politics. “In such context, a new generation has yet to articulate its detailed concerns, and its leaders have yet to emerge". Marian Chiriac is BIRN Romania editor. Balkan Insight is BIRN`s online publication. Here's one for your bookmarks. Browsing for information on remittances into Romania I came across "Romanian Migration to Spain - Motivation, Networks and Strategies" by Ana Bleahu, which is a working paper (careful PDF) from the Institute for Quality of Life at the Romanian Academy, Bucharest. The document is a mine of information, and very readable for the insight it offers on the actual motivations of the migrants. The paper also includes this very revealing chart, which just about says it all I think. 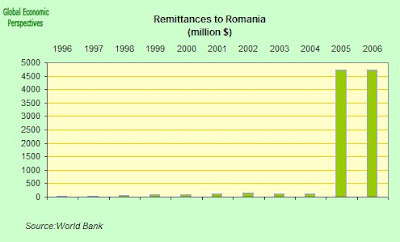 And while I'm up here posting, here's a reminder of the volume of remittances these Romanians are sending home (as measured by the World Bank, who openly recognise that this is minimum data, since accurate information here is virtually impossible to come by). 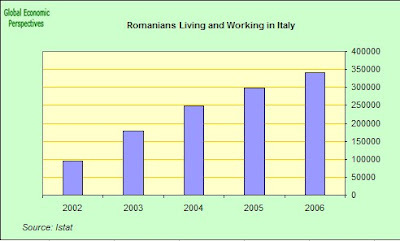 I think the conclusion we can draw here is that - even while accepting that the number of Romanians working in Spain and Italy increased significantly in 2005 and 2006, the very steep increase in the chart is more a by-product of the fact that the post 2004 data while still inadequate is nonetheless a big improvement on what was available earlier. 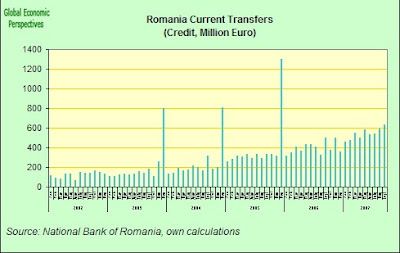 Another way of looking at this is to take the current transfers item in the monthly balance of payments data published by the National Bank of Romania. While this data has little validity in absolute terms - since it includes other kinds of transfer - in relative terms it can give us a much better appreciation of how the remittances situation has evolved over the years than the World Bank data can. It will also give us some sort of proxy indicator to track as we move forward. Be all this as it may, the world bank estimate the 2006 volume to have been some 4.1% of GDP, and that is very large, and with significant macroeconomic consequences as we are currently seeing. I think what no-one had thought about before was the way in which these remittances could be treated as an income stream and used to finance mortgage borrowing to fuel construction, with all the distortionary consequences we are now observing. MADRID. Romanian President Traian Basescu on Tuesday called on Spain to lift restrictions on Romanian workers in the country, AFP reported. "We want our citizens to be have the basic right of free circulation that came with membership of the European Union," Basescu, on a three-day visit to Spain, told an economic forum. The president, who was to meet later Tuesday with Spanish Prime Minister Jose Luis Rodriguez Zapatero, said the restrictions imposed by Madrid "would be helpful" to both countries. He said some half a million Romanians who have emigrated to Spain over the past few years "contribute to the economic growth" of the country. Voting in Romania's first European elections took place on Sunday with candidates vying to be among the 35 MEPs who will represent the country in the European Parliament. The official results will be announced on Wednesday 28 November and the elected MEPs will take up their seats in 2008. Romania joined the EU in January 2007, the other country that joined at that time, Bulgaria, elected its 18 MEPs in May this year. It was an obligation of EU membership that both countries should hold European elections in the first year of their membership. Before Bulgaria and Romania elected their MEPs, they were represented at Strasbourg and Brussels by Members nominated by the respective national Parliaments. In total 13 parties and 1 independent candidate stood in the election across Romania. Early figures show that the turnout was 28.3% - slightly higher than for a referendum on electoral reform also being held that day. Voters braved stormy conditions on Sunday to vote and reports say rural areas recorded a significantly higher turnout than the cities. In January this year Romania's President Mr Traian Băsescu addressed MEPs in Strasbourg. He told the House that "Romania's accession is a milestone. It is now ready to shed the burden of the past, and, true to its basic principles and values, assume its role as a Member State in the best spirit of Community solidarity". The 35 MEPs will represent Romania's 22 million people - the 7th largest population in the EU. BUCHAREST, Romania: Romanian President Traian Basescu on Monday named a former foreign minister as his choice to head the country's foreign intelligence service. Mihai Razvan Ungureanu served as foreign minister from 2004 until April when he was forced to resign in April after he failed to inform Prime Minister Calin Tariceanu Popescu that two Romanians had been arrested in Iraq by U.S. troops. Ungureanu, 39, is a historian by training and known for a pro-American stance. In 2005 he signed a 10-year agreement with U.S. Secretary of State Condoleezza Rice to set up U.S. bases on Romanian soil. The post heading the Romanian Foreign Intelligence Service has been vacant since its former chief, journalist Claudiu Saftoiu, resigned in March after he alleged that the service had illegally tapped the telephones of Romanian and foreign suspects with permission from prosecutors, instead of a judge's warrant as required by law. He later retracted his statement. Ungureanu's nomination must be approved by Parliament. First official results show the centrist opposition party of Romanian President Traian Basescu has won Romania's first European Parliament elections since it joined the European Union this year. As Stefan Bos reports from Budapest, representatives of the country's large Hungarian minority also secured seats in the European Parliament. Election officials say opposition parties received the most votes in elections for Romania's 35 representatives in the European Parliament. Results show that nearly one in three voters cast ballots Sunday for the Democratic Party of President Traian Basescu, while its fellow opposition Social Democratic Party came in second with about 20 percent of the vote. They beat the ruling National Liberal Party of Prime Minister Calin Popescu Tariceanu. He has been criticized by Romanians for his perceived failure to implement reforms aimed at improving living standards, that were promised when the country enthusiastically joined the European Union, January . The E.U. executive branch, the European Commission, has threatened to cut-off more than $260 million in aid to Romania next month, unless the government improves the way it handles agriculture subsidies and tackles corruption. The leader of the victorious Democrats, Emil Boc, suggests the election results show his party is popular among voters seeking change. The Democratic Party has received most votes, he tells supporters. In his words the party is now "the most important political force in Romania." Among others securing seats in the European Parliament are representatives of Romania's one and one half million ethnic-Hungarians. They include an independent candidate, Reformed Bishop Laszlo Tokes, who played a key role in Romania's 1989 revolution against Communist rule. Bishop Tokes says he wants to cooperate in the European Parliament with the main political party of ethnic Hungarians, known as the Democratic Union of Hungarians in Romania, or RMDSZ. "We are focused on the national interests of Hungarians in Romania," Tokes says. And he adds: Next week I will meet the Hungarian RMDSZ party, to work on a wide strategy to make the dreams of ethnic Hungarians a reality." High on his wish list is improving educational opportunities and a more controversial demand for more autonomy for ethnic Hungarians. They mostly live in Transylvania, an area that belonged to Hungary till the 1920 Treaty of Trianon handed the region to Romania. Government and opposition officials in neighboring Hungary say they are pleased that ethnic Hungarians will be represented in the European Parliament. Bucharest - President Traian Basescu on Monday proposed former foreign minister Mihai Razvan Ungureanu as the new head of Romania's foreign intelligence service SIE. The 39-year-old historian Ungureanu has a fair change of being confirmed as SIE head by parliament after three parties already declared they would vote for him. The top position at the SIE has been vacant since March when then director Claudiu Saftoiu resigned over a scandal. He had publicly claimed the SIE had its own tapping technology, although the intelligence service is not legally allowed one. Ungureanu was Romania's foreign minister between December 2004 and February 2007 when Prime Minister Calin Popescu Tariceanu dismissed him from office after a row. With as many as 2m Romanians working abroad and fast economic growth, the country's labour market is growing increasingly tight. Unemployment in the country fell from 7 per cent in 2003 to 5.2 per cent at the end of 2006 and is nearer 4 per cent today. At the same time, overall wages have grown consistently at or near 20 per cent a year since 2002, according to data from the European Bank for Reconstruction and Development. In these circumstances, it is little surprise that developers in Bucharest are complaining it is hard to find the labour for their building sites. According to Clemens Grafe, Europe, Middle East and Africa economist at UBS, wage inflation is highest in low-skills sectors where working abroad is an easy option. He said: "In Romania, you see much quicker wage growth in the non-skilled sectors like hotels, restaurants and construction." Wage growth in the construction sector has outpaced overall wage inflation, with workers earning some 50 per cent more today than a year ago, according to Diwaker Singh, a Bucharest real estate developer. But the EBRD's employment data shows the story has roots in a period before Romania and Bulgaria joined the EU at the beginning of this year. 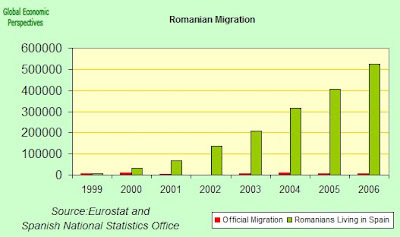 The single largest decline in the size of Romania's workforce occurred in 2002, when the country's citizens first gained visa-free access to the European Union. In that year, the country recorded a year-on-year decline of 12 per cent in the size of its labour force, since when the numbers have been relatively stable. The numbers for Bulgaria tell the same story, with unemployment declining continuously from 19.5 per cent in 2001 to 8.9 per cent at the end of last year. In Mr Grafe's view, wage convergence may remove the economic pressure that is driving migration flows sooner than many expect. He said: "We believe that the speed with which labour costs change will change completely. Migration is driving wage movements. In countries that have seen major migration, wage increases have speeded up dramatically." Historically, eastern Europe's wage levels had grown relatively slowly. "In countries like Poland, we expect 12 or 13 per cent wage increases. It used to be 2 to 3 per cent [before large-scale migration]." Preliminary results in Romania’s first elections to the European parliament show the country’s opposition Democratic party topping the poll with around 30 per cent of the vote. President Traian Basescu’s Democratic Party was supported by 29.2 percent of voters according to results based after a count of more than 75 per cent of the votes. The ex-communist Social Democracy Party is expected to grab second place with around 22 per cent, followed in third place by prime minister Calin Tariceanu’s centrist Liberals with 13 per cent. Graham Watson, leader of the Liberals and Democrats in the European parliament, said, "Liberals can be satisfied with at least six MEPs to work with in the European Parliament." Turnout at the elections was estimated at less than 30 per cent, according to Reuters, which invalidated a referendum on electoral reform that was held alongside the European assembly vote. "Romania still needs to be convinced of the importance of decision-making at EU level," said Watson. EPP leader Joseph Daul said, "These elections mark a watershed in relations between Bucharest and Brussels. Romania has a significant part to play in the development of the European Union." The EPP group said the new Romanian deputies will include 11 from the Democratic Party and two from the Democratic Alliance of Hungarians in Romania. "We are delighted to welcome the new colleagues with whom we are confident we will work successfully," said Joseph Daul and Wilfried Martens. Romania's nationalists fared poorly in Sunday's elections, with the leader of the Greater Romania Party, Corneliu Vadim Tudor, announcing on Sunday that he would resign from Romania’s parliament. Watson said that the defeat for the party was "one more nail in the coffin for the far-right forces in the European parliament". Sunday’s ballot was the first time that Romanians have elected MEPs since the country joined the EU on 1 January. The election also marks the first time since the 1989 anti-communist revolution that the leftist Social Democracy Party failed to win most votes in an election. BUCHAREST, Nov. 25 (Xinhua) -- The opposition Democratic Party (PD) on Sunday won the first elections of European Parliament in Romania, obtaining 31.5 percent of the votes, according to exit poll carried out by Center for the Study of Opinions and Market. The PD is followed by the Social Democratic Party, the largest opposition and also the largest party in Romania's national parliament with 21.1 percent while the ruling National Liberal Party (PNL) with 15.6 percent. The Liberal Democratic Party (PLD) obtained 6.9 percent, followed by the Hungarian Democratic Union of Romania (UDMR) with 6.2 percent. The other eight parties in the race for the European Parliament did not pass the 5 percent electoral threshold needed to enter the seat distribution stage. "We are the most powerful party in Romania," said the PD leader Emil Boc, stressing that the party's supporting share in the population has increased. The elections are the first ever held in Romania after the eastern European country entered the EU on Jan. 1, 2007. The total number of Romanian citizens who are eligible to vote is around 18.26 million and a low turnout in the election has been recorded. As many as 17,340 polling stations are open between 7 a.m. and 9 p.m. throughout Romania for the elections. Thirteen parties have entered the race for the European Parliament. BUCHAREST (Reuters) - Romania's centrist opposition Democrat party won the country's first election to the European Parliament on Sunday, an exit poll showed, underscoring its hopes of returning to power in next year's parliamentary polls. The exit poll by independent pollster TNS CSOP, conducted for Realitatea TV television, showed the Democrat Party of President Traian Basescu winning 31.7 percent of ballots. The vote for 35 deputies to the European assembly is seen as a litmus test of the popularity of leading political parties ahead of the general election, due to be held in late 2008. "We are the most important political force in Romania," said Democrat Party president Emil Boc. Prime Minister Calin Tariceanu's ruling Liberal Party trailed the Democrats with 15.2 percent of the ballots. But their score was a touch above expectations for some 13 percent, showing stable backing over the last year. Observers had expected the Liberals' standing to be eroded by disappointment over Bucharest's reform record which has lost momentum since Romania joined the European Union in January. "It is a wonderful evening for the Liberal Party because we managed to overcome expectations," the prime minister said. Bucharest's centrists, who came to power in 2004 on an anti-graft ticket, were praised initially for introducing broad justice and institutional reforms that won Romania EU entry after botched attempts by other post-communist governments. However, political bickering and a personal conflict between Tariceanu and Basescu have split the ruling alliance of Liberals and Democrats and led to a policy gridlock. Brussels has threatened to cut aid due to poor preparation in farming and has criticised the justice sector. EU sources say it is becoming clear Romania is standing still or relapsing in its fight on fraud, a key problem in the Balkan society. The ex-communist opposition Social Democrat Party won 20.8 percent of the vote. Low voter turnout of less than 30 percent invalidated a referendum on electoral reform, held alongside the European assembly vote. Nearly 90 percent of voters supported the plan to introduce French-style voting, meant to make politicians more accountable and curb top-level graft. Under Romanian rules, more than half of eligible voters must cast ballots to make a referendum valid. Basescu will now have to sign into law a rival plan to introduce German-style voting, backed by the government. The president had refused to sign the draft, pending the referendum. On November 26, many expect a new record to be set for Romania's capital markets sector. As of this date, investors will be able to begin subscribing for the initial public offering (IPO) of Transgaz, the state-owned natural gas transmission company. Investors and analysts alike are anxiously awaiting the event, which is expected to be the largest of its kind so far witnessed on the Bucharest Stock Exchange (BSE). Transgaz is the technical operator for the national gas transmission system in Romania. Its network of pipelines, stretching over 11,000 kilometres, not only carries most of Romania's natural gas, but also connects the country to pipelines in Hungary, Ukraine and Bulgaria. Importantly, the company is also a crucial part the Nabucco gas pipeline project. This project, which is set to be completed in 2012, is expected to greatly diminish Europe's reliance on Russian oil and gas by linking the European continent's existing pipelines to energy supplies in Iran, Azerbaijan, Kazakhstan, Turkmenistan, Egypt and Syria. Transgaz's stake in this project extends beyond the fact that Romania will have a key section of the 3300-kilometre pipeline. The company also holds a 20% stake in Nabucco Gas Pipeline International, the consortium formed to build and manage the pipeline. This could prove valuable if Transgaz should decide to sell, which is a possibility as it is rumoured Gaz de France and the German RWE are interested in purchasing a large stake from any of the consortium's five owners. At the moment, Transgaz is entirely owned by the Romanian state. The ministry of economy holds an 85% stake, and the Fondul Proprietatea, a fund set up by the government to compensate Romanians whose properties were seized under communism, holds the remaining 15%. In October 2007, the government announced it planned to raise roughly 67m euros ($99m) by selling a 10% stake in Transgaz through an IPO on the BSE. The government promised the funds would be used to finance the planned renovation and modernisation of the national transmission system. The renovation, which aims to improve the system's operation and efficiency, will focus on upgrading the existing pipelines and compressor units, as well as adding metering installations to monitor usage and leakages. The planned IPO, starting on Monday, will end on December 7. The shares will be offered for subscription in two stages: 60% of the IPO is to be allotted to large investors, with subscriptions that exceed 500,000RON ($206,000). The remaining 40% will be open to small investors with subscriptions ranging from 2000RON ($824) to 500,000RON. Many analysts have said they believe the company's key role in the region's energy politics, combined with Europe's growing demand for natural gas, will attract a strong interest from investors worldwide. Steven van Groningen, chairman of Austria-based Raiffeisen Bank, the firm in charge of preparing the offering, stated the Transgaz IPO could attract more than 10,000 investors. This number would far surpass the 5000 investors who subscribed to the Transelectrica IPO last summer, which is regarded by many as the most successful government privatisation to date. The IPO comes at a perfect time to test new changes to the BSE. "The Transgaz public offering will use allotment rights for the first time in Romania, with trading set to begin approximately three days from clearing. This way, investors will no longer have their money stuck for two months, and will be able to sell their investment as early as this year. We anticipate the trading of the allotment rights will start around December 19," said Dana Mirela Ionescu, general manager of Raiffeisen Capital & Investment Romania. The introduction of allotment rights trading is meant to close the gap between the point at which an investor subscribes for an IPO and when he can actually begin trading his shares. Up until now, investors have had to wait weeks, and in some cases months, for the IPO to clear government regulators. Under the new system, investors will be granted allotment rights for every share they have been awarded through the IPO subscription. These rights can then be traded or sold in the same way as a normal stock. Once the stock clears the regulators' desks, all allotment rights will be converted into Transgaz shares. Analysts hope that such changes can bring a new enthusiasm to the market, but they are realistic about the real problems facing the BSE. "Volumes are far too low to attract serious international attention," said Cristian Sima, president of World Wide Brokerage Service and a former BSE board member. This is where the Transgaz IPO may have its largest effect. If 10,000 investors turn out for the IPO - as suggested by van Groningen earlier this week - this would amount to a figure equal to the average number of active investors on the BSE over the past several months. While doubling the market's daily volume is unlikely, it is clear the size and importance of this IPO could reinvigorate the BSE at a time when markets worldwide are in desperate need of encouragement. back to the attention of foreign investors," said Adrian Caramiha, deputy general manager of Broker Cluj. The wine production is set to surpass 6 M hectolitres in 2007, over 20 per cent larger than the one registered in 2006, Claudiu Necsulescu, the President of the National Inter-professional Wine Organisation (ONIV), stated, Nine o'Clock reports. Out of the total, 3.6 M hectoliters represent the local producers' market offer while the remaining figure represents the household and self-consumption production. 'Although 2005 has been a disastrous year for the wine industry, in 2006 and 2007 there were positive signs of recovery for this sector, especially since the 'SAPARD' program has been started' Necsulescu stated. Romania ranks 5th when it comes to total vineyard area, 6th when it comes to grape production and 6th when it comes to wine production, registering 8 viticulture regions, 37 vineyards and 171 viticulture centres. Romania has exported around 18,163 hectolitres of wine, with imports registering a figure almost 3 times larger – 71,330 hectolitres. Wine exports went to Germany, the Russian Federation, the United States, the Republic of Moldova, Great Britain, Estonia and Bulgaria, while the imports came from the Republic of Moldova, Spain, Italy, Hungary, France and Germany. SOFIA: Romania goes to the polls on Sunday to elect its MEPs and the Socialists, despite trailing in the opinion polls, are "well-placed" to do well. That was the forecast of MEP Adrian Severin, leader of the country's Socialist delegation in parliament. Speaking on Friday at the two-day annual Party of European Socialists (PES) council in Sofia, Severin said, "These are extremely important elections, notably because they are the first European elections my country has held. "But they are important for another reason. It will also be the first electoral test of the new PES election manifesto. The full manifesto is, of course, still be drafted and subject to consultation. "But we have campaigned on some of its proposals, such as climate change, in the run up to this weekend's election. "I cannot predict the outcome but am quietly confident my party will do well. Fortunately, I am pleased to say that, generally, the campaign has been devoid of the scandals so characteristic of my country in the past. We have also tried to orientate the campaign towards Europe and EU issues." Although Romania has not yet held European elections, it has had representatives in parliament since its accession on 1 January. Thirty-five "temporary" MEPs were nominated in 2005 by the Romanian parliament and some of these "observers" will run in Sunday's election. The campaign has, however, failed to capture the imagination of the Romanian public, sparking fears of a particularly low voter turnout. There are currently 12 Socialist and seven centre-right MEPs among Romania's 35-strong parliamentary delegation. Speaking ahead of the election, parliament's president, Hans-Gert Poettering, said, "The European elections will be a further significant step on Romania's transformation and integration into the EU." BUCHAREST (Reuters) - Romanians began voting in their first election to the European Parliament on Sunday with surveys showing the opposition Democrat party of President Traian Basescu poised to win a year before a parliamentary poll. The vote for 35 deputies to the European assembly is seen as a litmus test of the popularity of leading political parties ahead of the election. Support for the centrist Democrat party has risen after Basescu's straight-talking style convinced many voters he is serious about fighting corruption, a major problem in the new European Union member state. He hopes his party will return to power after Prime Minister Calin Tariceanu expelled it from the ruling coalition with his Liberal party in April. "The election will be a test for the parties ... For Traian Basescu, the poll will be an examination of his capacity to transfer his popularity on to the Democrats," said Florin Ciornei from major daily Evenimentul Zilei in an opinion column. Surveys show the vote will point to disappointment with the government's reform record since EU accession in January. In the latest polls, the Democrats were seen winning 40 percent of ballots, compared with the Liberals' 13 percent. Disillusionment has grown since the EU threatened to cut aid to Romania because of poor preparation in farming and has criticised the justice sector. EU sources say it is becoming clear Romania is standing still or going backwards in its fight on fraud. Transparency International, an organisation that monitors corruption, ranks Romania as the most graft-prone EU member state. The coalition of Tariceanu's and Basescu's centrists, which came to power in 2004, was praised initially for introducing vast justice and institutional reforms that won Romania EU entry after botched attempts by other post-communist governments. However, political bickering fragmented the coalition and led to a policy gridlock this year. The European election is held alongside a referendum on electoral reform meant to make politicians more accountable to voters and curb top-level graft. Polling stations close at 7 p.m. British time. 23 11 2007 Bucharest _ Romanians are going to the polls on Sunday in their country’s first elections to the European Parliament. Over 18 million people are registered to vote, but polls show the turnout will be relatively low, around 50 per cent. "Despite their strong support for the EU, Romanians are not yet concerned by real European issues”, political analyst Stelian Tanase told Balkan Insight. Romania elects 35 representatives to join the European Parliament. The electorate can choose from among 13 parties or a single independent candidate on the list. Candidates will be elected via proportional representation. The Balkan country which joined the EU at the beginning of this year, is also holding a referendum on changing the system through which its members of parliament are elected. The current electoral system is based on party lists, and the changes would allow Romanians to vote directly for individual candidates. The new plan also envisages a reduction in the number of seats by 20 per cent. The elections were originally scheduled for May this year, but had to be postponed, due to political infighting, between the country's President Traian Basescu and Prime Minister Calin Popescu Tariceanu. A month before the scheduled vote, Basescu easily beat off an attempt to impeach him when he won a landslide victory in a referendum. BUCHAREST, Nov 23 (Reuters) - The Romanian leu has fallen beyond its "equilibrium" level of 3.4 lei per euro in recent days in response to global market turbulence and earlier unsustainable gains, Finance Minister Varujan Vosganian said on Friday. Vosganian also said the weakening of the leu will help to consolidate export competitiveness and discourage some imports. "The equilibrium level of the national currency is 3.4 per euro, if we take into account economic competitiveness, trade and productivity in Romania," Vosganian said in a statement. One of Europe's best performing currencies in the first half of 2007, the leu has lost some 16 percent against the euro since a five-year high in the summer due to worries over sustainability of the economy and a yawning external shortfall. On Friday it hit a nearly 2-year low of 3.6900 per euro before recouping some ground in what dealers said was covert central bank intervention. The bank declined to comment. Vosganian said Romania's yawning external shortfall, which has fanned much of the foreign investor concerns that powered the leu decline, leaves the economy vulnerable to global shocks. But it is unavoidable as the European Union newcomer races to catch up with its western neighbours. The central bank and international observers have repeatedly urged the government to tighten fiscal and wage policies to boost economic competitiveness and to curb the external gap. "Certainly, a more unfavourable external economic climate correlated with the existence of a high current account deficit pushes us to promote prudent wage policy in the public sector, including the minimum salary hike policy," Vosganian said. The leu showed no reaction to Vosganian's comments and dealers said the market sees more room for leu weakening. Irish Michael Whelan, one of the country’s biggest property developers, is planning to significantly boost his commercial investment in Romania to more than €1 billion – reports independent.ie. Whelan’s Moritz firm has signaled that its Romania investment vehicle Mivan, is to spend €300 million to develop a major new business complex in the country’s capital, Bucharest, and also intends to build a €100 million logistics park in the city. The massive new investment comes on top of a €700 million blueprint announced earlier this year by Whelan to build 10 shopping malls in Romania. So far Mivan and Moritz have spent €150 million on land for the retail project, and could spend a further €700 million to develop the sites. It is understood that 70% of the land required to construct the shopping malls has been accumulated to date. Whelan, whose Moritz firm owns Maplewood Developments in Ireland, has also been buying additional land in Bucharest and elsewhere in Romania, and intends building 2,000 apartments in the country over the next five years. Moritz has total assets well in excess of €500 million. Whelan is one of a number of Irish businessmen who have been ploughing money into eastern Europe in order to counter the adverse impact of a slowing Irish property market and capitalize on expanding European Union membership. BUCHAREST, Nov. 22 (Xinhua) -- Romania and Kazakhstan will cooperate in transporting Caspian oil to European consumer markets, the Romanian and Kazakh presidents stressed in a joint press statement on Thursday. Kazakhstan is interested in the development of the Constanta-Trieste pipeline project, said Kazakh President Nursultan Nazarbaev, who arrived in Bucharest for a two-day state visit. The Constanta-Trieste pipeline is a five-country project for transporting oil from Caspian region via the Black Sea to European markets. The project envisages construction of a pipeline from the Black Sea port of Constanta, passing through the territories of Romania, Serbia, Croatia, and Slovenia and terminating at Trieste in Italy. Kazakhstan anticipates an output of about 150 million tons of oil annually by 2015. Such volumes necessitate multiple export outlets, of which the route via Constanta to Italy can be an attractive one. From Trieste, the proposed pipeline can be connected with the Trans-Alpine Pipeline Network, which links Italy with Austria and southern Germany. Kazakhstan is much interested in the development of a pipeline linking the Caspian Sea and Black Sea ports, since "Kazakhstan cango out to Europe and to the world" via the Port of Constanta, Nazarbaev said. Romanian President Traian Basescu said that the development of relations with Kazakhstan is a priority for Romania, saying his country also wants to increase relations with Azerbaijan and Turkmenistan. BUCHAREST, Nov 22 (Reuters) - Romania's central bank governor warned against steep moves in currency exchange rates on Thursday, but steered clear of making specific comments about a sharp fall in the leu to 22-month lows against the euro. The leu has fallen some 15 percent since hitting a 5-year high against the euro in July to reach a low of 3.6450 per euro on Thursday amid worries over Romania's swollen current account deficit. Asked about the leu's fall on Wednesday and Thursday, Isarescu told a business television station: "In spite of the fact that we target inflation ... we are not comfortable with large exchange rate variations." "We do not target the exchange rate ... but large exchange rate variations are not good for the economy and ... we reserve the right, without commenting, to have all sorts of policies ... sometimes obscure ones to stabilise the currency market." Earlier on Thursday, an adviser to Isarescu, Lucian Croitoru, said the leu's decline represented a return to sustainable levels. His comments gave a further push down to the leu. Investors are concerned Romania's double-digit current account deficit is unsustainable in the face of a global liquidity crunch and could spark a larger correction in the leu. Isarescu also said the currency is a victim of turbulence on global markets. "The situation on the currency market ... depends very much on what is going on in the world. And for three months, the word turbulence is current everywhere in the world," he said. "Investors ... need to know the central bank will work with all intelligence to diminish (its) negative effects ... but we are in a globalised world and turbulences can be softened but in no way annihilated," Isarescu added. The central bank and international observers have repeatedly urged the centrist minority government to tighten fiscal and wage policies to reign in demand and boost economic productivity and competitiveness. Five years ago Raiffeisen International, the Austrian-based bank with the largest reach into eastern Europe, bought Casa Agricola, a struggling state-owned Romanian bank, for $45m and invested about $250m in its modernisation. Today, analysts estimate the bank could be sold for $2.5bn (€1.68bn, £1.22bn). The rise in value is attributed to Raiffeisen’s success in overhauling Casa Agricola and to Romania’s soaring economic growth, rapid credit expansion and spiralling asset appreciation. Many business people in Bucharest see many similar success stories developing. The country is now safely inside the European Union, and many investors feel there are profits to be made from banking, real estate and other sectors. “We have only just begun,” says Diwaker Singh, managing director of Copper Beech, a UK-owned property developer, which has recently embarked on a €2.5bn five-year plan to build 16,500 homes. The International Monetary Fund sees things differently. Concerned about the global credit market turmoil, the fund is warning about the dangers of economic overheating in Romania, citing a yawning current-account deficit. Achieving a better balance is important for Romania and for the EU. Since 2000, gross domestic product has grown at an average rate of more than 6 per cent, the fastest rate in the Union outside the small Baltic states. EU investors have piled into Romania, attracted by a market of 20m (eastern Europe’s second largest after Poland) and opportunities to establish low-cost export bases. Fuelled by privatisation, foreign direct investment last year exceeded €10bn, the region’s highest. But now the economic warning signs are mounting. Inflation, which had been falling steadily in recent years, jumped to 6 per cent last month from a low of 4 per cent in July. Rising world energy and food prices, compounded by drought in Romania, are playing their part. But so is soaring local pay, which is set to rise by about 25 per cent a year, or about 20 per cent in real terms. The IMF calculates that while Romanian pay (averaging €7,000 a year) remains among the lowest in the EU, it has risen faster than anywhere else. Mr Fernandez-Ansola says that, with productivity rising at less than 10 per cent annually, the increases are “unsustainable”. Moreover, whereas in other ex-communist states pay increases are generally driven by private companies, in Romania the public sector is in the lead, thanks to strong trade unions, which have just forced a 28 per cent rise in the minimum wage. Pensions are also soaring, with a 43 per cent increase now being implemented, and a further 30 per cent rise approved for early 2009. Rising pay is helping to fuel a credit surge, particularly in home loans. Credit is set to grow 50-60 per cent this year, following 53 per cent in 2006. The IMF warns that borrowers might be assuming too much risk, especially as about half the loans are in foreign currency, mainly euros. But bankers argue that overall debt levels are low at 30 per cent of GDP and that they are acting prudently, for example in requiring 25 per cent deposits for mortgages. But there is no doubt credit is financing soaring increases in imports, boosting this year’s likely current account deficit to 14-15 per cent of GDP – a level the IMF considers dangerous. Last year the €10bn deficit was largely financed by privatisation-boosted FDI of €9bn. But this year’s forecast FDI of €7bn will fall far short of the likely €17bn deficit – leaving banks to finance the gap with credit, much of it short-term. For the IMF this is unsustainable, particularly with global conditions worsening. But Bucharest-based bankers argue much of the credit is quasi-investment as it is provided in-house by multinational banks to their Romanian subsidiaries. The IMF is urging the authorities to cool the economy. While it welcomes recent interest rates increases it remains worried about fiscal policy. The budget deficits – 1.5 per cent of GDP forecast for this year and 2.7 per cent planned for 2008 – are not huge in themselves. But the IMF says that in current circumstances they are too big. The minority National Liberal government of Calin Tarinceanu, prime minister, is too weak to take decisive action, following the collapse of its alliance with President Traian Basescu’s Democrats. BUCHAREST, Nov 21 (Reuters) - The Romanian leu's sharp fall to a one-year low is part of a natural correction towards levels in line with the country's economic fundamentals, an adviser to the central bank governor said on Wednesday. Lucian Croitoru also said the bank was focused on inflation figures when assessing the need to curb demand rather than on the currency's exchange rate. But he said a weaker leu could still play a role in interest rate decisions. Asked about the decline of the leu, Croitoru told Reuters: "It is normal, because the unit is returning from a unsustainable level reached in July. What is going on now is part of a correction process towards a level more consistent with fundamentals in Romania." The leu fell as low as 3.5430 per euro on Wednesday, its lowest level since October 2006. It has shed some 13 percent since hitting a five-year high in July. Analysts have said the decline is mainly due to concerns about Romania's long-term economic prospects as international observers have warned that the new European Union member faces overheating. Standard & Poor's cut its outlook on Romania to negative from stable in November, saying it was concerned about an insufficient policy response to a ballooning external deficit. Referring to the leu weakening Croitoru also said: "Turbulence on the international financial markets has really helped that." Earlier this month the central bank revised up its inflation forecasts for this year and next, due to rising food costs and a worsening outlook for the leu. It also raised interest rates by half a percentage point to 7.50 percent in October. Croitoru moved to water down any expectations that the latest bout of leu weakening was putting pressure on the central bank to continue raising borrowing costs. "The central bank is adjusting its (monetary policy) intervention regarding inflation in accordance with inflation, not in accordance with the exchange rate," he said when asked about such potential pressures. But he said some impact on rates may be inevitable. "If you ask me about the effect of depreciation (on inflation), I can say that it is bigger than an appreciation can have on deflation." "So, it is possible for (the weaker leu) to be a factor that can influence a (rate) decision. Tehran, 21 November 2007 (CHN Foreign Desk) – Representative of ICHHTO is due to make a visit to Romania to bring back the ancient Iranian rhyton. Based on previous diplomatic negotiations between Iran’s Embassy in Romania and the authorities of this country, the returning of this rhyton will be made by agreement of Romanian cultural heritage authorities. This historic artifact which belongs to the 800-1000 BC was smuggled out of Iran. Expressing his satisfaction with the trend of retrieval of Iranian historical relics due to its membership in UNESCO’s 1970 and 1995 conventions, Ghanami said that Iran is also following the case for redeeming its historic objects from Italy and United Arab Emirates. Rhyton is a kind of cup with the head of an animal, usually in the shape of a lion, horse, ibex, or winged lion attached. According to Nosrati, some other rhytons similar to this one have been discovered in Iran and one of the most similar ones was found in Kalouraz region in Gilan which is currently kept in Iran’s National Museum. Deputy head of the legal department of ICHHTO or one of the other authorities of this Organization will fly to Romania next week to take this historic rhyton back to its home country. Ukraine introduces a visa-free regime with Bulgaria and Romania since the moment when the agreement on facilitating the visa registration procedure for Ukrainians, which was signed between Ukraine and EU in Luxembourg on 18 June, 2007, comes into force. According to an UNIAN correspondent, Foreign Minister of Ukraine Arseniy Yatseniuk claimed this to journalists in the Cabinet of Ministers today. “After the Ukraine-EU Summit, the question of giving visa-free regime to Romania and Bulgaria was raised. The stance of Ukraine was declared clearly: we give the visa-free regime to Romania and Bulgaria simultaneously with coming into force of the agreement on facilitated visa regime for Ukrainians. This decision was adopted by the government of Ukraine today”, A.Yatseniuk stressed. The Minister specified that the rules of entrance and departure for foreigners at the Ukrainian territory are regulated with a respective order of the government. “It is not necessary to adopt a special law to introduce the visa-free regime”, he said. BUCHAREST, Romania: Romania's justice minister said Tuesday that hundreds of high-level corruption cases are still unresolved and are blocking justice reforms that the European Union has told Romania it needs to carry out. "The situation would have been so much better if high-level corruption cases had been resolved; that would have sent a good political signal," Tudor Chiuariu told foreign journalists. He said that some magistrates were still not free of outside interference. "A magistrate who wants to do his job has nothing to be afraid of. However, some are obedient to political and economic interests," he said. Romania joined the European Union on Jan. 1, and was told to continue to implement reforms in the justice system, which has been blighted by political interference since communism ended in 1989. The minister himself is under investigation in a real estate deal, where he allegedly sold public land to a private company. He denied wrongdoing and told journalists the case was politically motivated. Labor Minister Paul Pacuraru; former Prime Minister Adrian Nastase; former telecommunications minister Zsolt Nagy; former agriculture minister Decebal Traian Remes; former economy minister Codrut Seres; and former transportation minister Miron Mitrea are all under investigation for corruption, but not one of the cases has been resolved. Although there have been reforms, Chiuariu conceded that the system still does not work "effectively." Some 300 corruption cases are blocked in the system, because of overlapping competencies of three institutions dealing with corruption, he said. At least 33 of them are deemed important cases, that "we would very much want to see resolved," said Chiuariu. Romania's parliament recently passed a new privacy bill that some say will suppress anti-corruption efforts. It stipulates jail terms for anyone who releases the contents of intercepted conversations. Right groups, including the country's Helsinki Committee, warn that the bill "puts the media under a lot of pressure" and have called on President Traian Basescu to exercise his veto power. Lawmakers passed the bill just weeks after Romanian public television (TVR) broadcast a video of Agriculture Minister Decebal Traian Remes accepting a bribe. Some say the country's political leaders appear more anxious to punish investigative reporters than deal with corruption. The Remes scandal -- one of the biggest to hit the country -- resulted in the minister's resignation. The video also implicated former Agriculture Minister Ioan Muresan and local businessman Gheorghe Ciorba. A hidden camera recorded a meeting in a Bucharest cafe between Remes and Muresan, during which Muresan gave Remes an envelope. The TVR broadcast also included taped phone conversations with Ciorba, who is heard saying he wanted to win tenders worth millions of euro in institutions that were co-ordinated by Remes. In the phone calls, Ciorba asked Muresan to be an intermediary with Remes, offering 15,000 euros, traditional sausages and a new car. After the broadcast aired, Remes was asked to leave office by Prime Minister Calin Popescu Tariceanu, while authorities began investigating the source of the story. "It appears that the images were produced by the organisation that was investigating the case," Tariceanu said. For many Romanians, the tape simply confirmed their suspicions. "This is how things work here. I would have been surprised if the minister had refused the money," Adrian Barbu, a young doctor from Constanta, told Southeast European Times. "It was important because everybody saw the real faces of the people they voted for," he said. "It was normal for TVR to broadcast the tape," said media analyst Iulian Comanescu. "But they should have balanced the story and then shown it to the people. Instead, they presented a bomb." Last week, during an NGO conference in Bucharest, US Ambassador to Romania Nicholas Taubman joined the debate. "It was striking to me that when a television station recently aired an investigative story about alleged official corruption, the reaction of some was to attack the media outlet and the journalists who had prepared the report, rather than to focus on the serious allegations brought forward by the media," he said. He called on parliament not to "intimidate" independent media or "criminalise" journalistic efforts. Romania's Chamber of Deputies President Bogdan Olteanu insists that journalists will remain exempt from prosecution, due to laws protecting freedom of the press. The new legislation, he said, intends to punish state authorities who leak private information about citizens. BUCHAREST, Romania: Romania's prime minister said Tuesday that he was bringing "a bit of justice" to owners whose property was confiscated by the communists, as his government began to pay cash compensation to more than 5,100 former property owners. "I am glad to see this moment", said Prime Minister Calin Popescu Tariceanu in a ceremony where he handed payment slips to the first 20 people to receive cash compensation for their confiscated properties under a law passed by his government in 2005. "We managed to bring a little bit of justice to those who suffered so much," said Tariceanu. "It was a long and difficult process for owners to regain their properties. I think it's a normal gesture in a country that functions under the rule of law." The government has established a Property Fund to pay damages for assets that cannot be returned. Romanians who were stripped of their properties and cannot claim them back because they do not exist anymore can receive cash as well as shares in the fund, which will be listed on the Bucharest Stock Exchange. The total cost of the damages for all private, community and religious property is estimated at up to €8 billion (US$11.6 billion). A total of 5,107 Romanians are entitled to compensation. The maximum amount that can be given in cash is 500,000 lei (€147,000; US$215,000). Property restitution has been a thorny issue in Romania since communism ended in 1989. A restitution law passed by the former leftist government in 2001 exempted embassies, public buildings and political parties. In recent years, some public property has been handed back to private owners. The communists, who took over in 1945, seized houses, factories, castles, farms, forests and other real estate that was privately owned. Under communism, people were allowed to own small plots of land and one piece of property such as an apartment or a small house. BUCHAREST, Nov 20 (Reuters) - Romania may raise the listed stake in state-owned gas pipeline operator Transgaz if its initial public offering this year is successful, Finance and Economy Minister Varujan Vosganian said on Tuesday. Transgaz is seeking to raise roughly 67 million euros ($99 million) to help fund infrastructure expansion, by selling a 10 percent stake in an IPO, the Bucharest Stock Exchange's largest so far. Investors can subscribe to the IPO between Nov. 26 and Dec. 7 with the listing likely in February 2008. "We are taking into account the possibility of increasing the Transgaz offer as a percentage of its ... capital in case the market will react favourably (to the IPO)," Vosganian told a news conference. He did not provide details. "We are obviously counting on an oversubscription," he said. State monopoly Transgaz, part of a consortium planning to build the Nabucco gas pipeline to bring Iranian and Caspian gas to central Europe, will offer 1.17 million new shares at 191.9 lei ($80.63) per share. In the IPO, around 40 percent of the shares will be on offer for small buyers, who could subscribe up to 500,000 lei, with the rest directed at large-scale investors. Raiffeisen Capital & Investment, the local brokerage unit of Raiffeisen Bank, will oversee the IPO, which analysts said will breathe life into Bucharest's illiquid bourse. Vosganian also mentioned further plans to list minority stakes in state-owned energy firms, such as nuclear power operator Nuclearelectrica, hydro electricity firm Hidroelectrica, gas producer Romgaz and coal-fired energy holdings. "Probably Hidroelectrica is best prepared for this (at the moment)," he said. Transgaz, which reported a 68 percent annual rise in net profit to 161.5 million lei in 2006 and a return on equity of 7 percent, aims to boost relations with foreign operators. It is one of six prospective partners in the Nabucco pipeline, a long-delayed 4.6 billion euro project seen as a key plank in European Union plans to ease dependence on Russian gas. On Tuesday, Transgaz director Ioan Rusu said the five existing partners in the Nabucco project should pick the sixth partner and move forward with the pipeline by the first quarter of next year. "We believe that in the first quarter of 2008 the Nabucco project will move on to the next stage ... the auctioning of transport capacities," Rusu said.